VATICAN CITY (CNS) — The Catholic Church in Colombia not only has taken an active role in peace negotiations between the government and guerrilla groups, but also has remained close with countless innocents caught in the crossfire, said the Colombian bishops’ representative to the National Council for Peace. “Here (in Colombia), we have a church that is very alive, with an enormous ability to give witness to others, and that made a decision at a certain point to maintain a prophetic, clear voice of proclaiming that transformations and structural changes were necessary, but without abandoning the people in the territories,” he said. Msgr. 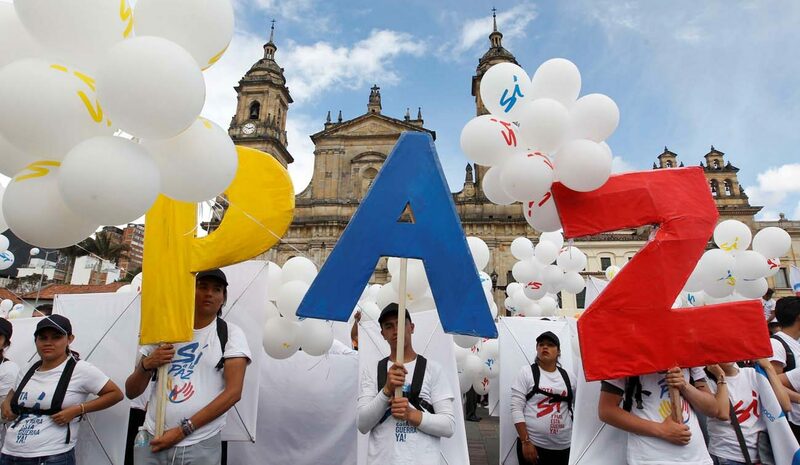 Henao, who also directs the church’s charitable agency in Colombia, Caritas, told CNS that, during the peace process, the bishops’ conference made consistent calls for a peaceful and political solution to the conflict and facilitating negotiations with several guerrilla groups. “There was a long period of the church accompanying the communities living in the territories where the guerrilla was present. And it was an uninterrupted accompaniment of the church in war zones. This was very important,” Msgr. Henao said. However, he said, despite their efforts in creating a “reconciliation commission” to advance talks between the Colombian government and guerrilla groups, tensions rose that led to atrocities committed by both sides. “One of the greatest difficulties when there is an armed conflict is that — to destroy the adversary, regain control of territories and to establish a territorial dominion — in these cases, sometimes abuses and violations of human rights were committed by all parties involved,” Msgr. Henao told CNS. Crimes such as “guerrilla (warfare), kidnappings, extortions and massacres” were “grave atrocities against human rights. There were also agents of the state who committed those acts,” he said. The Vatican announced July 7 that the pope will beatify Bishop Jesus Emilio Jaramillo Monsalve of Arauca during a Mass in Villavicencio Sept. 8. He also will beatify Father Pedro Ramirez Ramos, known as “the martyr of Armero,” and killed at the start of the Colombian civil war in 1948. Bishop Jaramillo and a local priest were kidnapped in 1989 by members the National Liberation Army. More commonly known by the Spanish acronym ELN, the Marxist guerrilla group captured him because of his criticism of the rebels’ violent actions. He also said the church’s work is far from over, despite a 2016 peace deal between the government and Revolutionary Armed Forces of Colombia, known by its Spanish acronym as FARC. The church is also assisting in peace talks with the ELN taking place in Quito, Ecuador, but its main effort, Msgr. Henao said, is to promote reconciliation. However, Msgr. Henao told CNS that despite the difficulty of rebuilding lives after so many years of war, Colombia remains an example for other countries that the path toward peace, although arduous, can be achieved through sincere negotiations.